Googling the nearest gas station, sending email from your smartphone, or booking a table at a restaurant: Those are all things you shouldn't do while driving. But so many drivers have grown accustomed to their on-the-go tasks that automakers are increasingly trying to make those things easier to pull off with both hands on the wheel and both eyes on the road. As General Motors and Ford commissioned ideas from app makers this week, the possibilities for what you can do with your vehicle's steering wheel buttons, microphone, speakers and internal gauges are quickly expanding. How would you like to choose your favorite tune by simply uttering the song's title, turn your car into a mobile Wi-Fi hotspot, or respond to an ad you hear on the radio without lifting a finger? At the International CES show, General Motors and Ford launched programs that will open their designs to developers, inviting them to create software applications for future car models. It's a relatively new strategy for car makers, but one that many gadget manufacturers employ, including Apple, which did it for the original iPhone in 2007. The programs free the automakers from having to keep pace with new technologies by tying the functionality of their cars' internal systems to advances in smartphones. Ford Motor Co.'s app developer program, called Sync AppLink, "is a way for (the company) not to worry about the next big app," said product manager Julius Marchwicki. General Motors Co. said its framework "gives developers a whole new sandbox, with wheels." In some ways, though, the current systems inside cars have a long ways to go to provide the functionality that smartphones have offered for years. 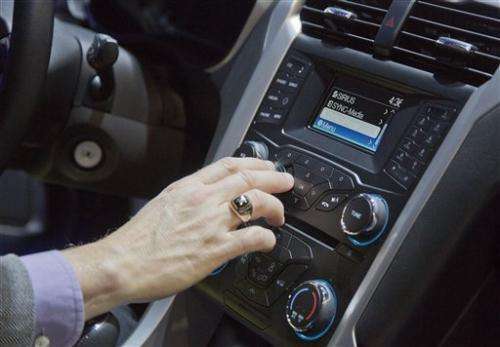 For instance, in a demo of Ford's new integration with music service Rhapsody, you can wirelessly sync your phone with the car and listen to playlists you have already created by pressing the voice button on the steering wheel and saying "play playlist 1." But you can't just choose a track by voice on a whim, which is part of what makes these unlimited streaming plans attractive even at $10 a month. Saying "Bruno Mars" to your Ford car won't pull up "Locked Out of Heaven," although typing it on Rhapsody's website or smartphone app can. The same is true of Pandora's radio app in Ford cars. The company plans to improve the car's ability to respond to voice commands that cover a wider range of search terms and speech in AppLink 2.0, which is expected out by September of this year, said C.J. King, development engineer for AppLink. General Motors showed off its new relationship with Apple's Siri voice assistant, which is newly integrated in some of its cars including the Chevy Spark. Siri, however, only linked up to the car's speaker and microphone and didn't offer access to the car's inner systems. Rhapsody CEO Jon Irwin said that it's really just the beginning for automakers to work more closely with high-tech content providers. "This is the first step in what's going to be a really exciting year," Irwin said. "As that technology evolves, you'll see it get better and better." When it comes to integrating new driver-friendly advancements, American automakers are playing catch-up to their Asian counterparts. Hyundai's Blue Link technology syncs with iPhones and Android devices already and allows users to check their car's maintenance data like tire pressure, fluids and the condition of airbags on their mobile devices. The service debuted in 2011 on its Sonata and is expanding to a wider range of vehicles. Voice-activated control of third-party music apps isn't integrated yet, but the company is exploring using Google's Android software to do so. Toyota's use of voice is the most advanced of the auto providers, even though it had nothing new to show at this year's CES. When it upgraded its Entune service for Toyota cars and Enform for its Lexus line at CES last year, drivers got the ability to use their voice to control several key apps, allowing them to say, for example, "Adele" to the iHeart Radio or Pandora app to create a custom station with tracks from the British singer and others who sound similar. Voice commands also worked to buy movie tickets, make restaurant reservations through the OpenTable app and get turn-by-turn navigation towards cheap gas. Both Toyota's and Hyundai's systems require yearly subscription fees after free trial periods. On Chrysler's Ram 1500 truck introduced at the gadget show this year, iHeart Radio was added as an application. Users who link their smartphones to the car can select from customized stations they've made already but aren't able to create new ones by voice. That is not likely to be a barrier for long, said Brian Lakamp, president of iHeart parent Clear Channel Digital. "Voice activation—it's a trend and it's going to get more and more sophisticated over time," Lakamp said. "We'll be lock-step when they're taking advantage of voice to the extent they can." The truck also includes the option of using a 3G cellular phone chip inside the vehicle itself to become a Wi-Fi hotspot for $15 a day. That could be an attractive feature for people who might want to use the truck for a tail-gate party. And one small company called Livio was looking to drum up some business from radio stations and automakers with a prototype for embedding tiny codes inside traditional FM radio streams. The codes would allow cellphone users to respond to advertisements with a tap on their smartphone screen. The technology could one day enable companies to send coupons through traditional FM radio stations to drivers who let them know they're interested. The Livio Connect system "opens FM radio to two-way communication," said marketing director Nicole Yelland. "No longer is it shouting at you. There's a dialogue." Given that Google, Toyota and others have been testing driverless cars, it's not hard to imagine the day when your smartphone will hear your stomach gurgle, get Burger King to send you a coupon, and then guide the car up to the drive-thru window for a quick bite.